A Day for Science Traffic Safety Costs | Kind.Fund: Crowdfunding and fundraising for personal causes and charities. It is important to continue to support this march and science overall. I think it's important that we continue to show public support for science advocacy! 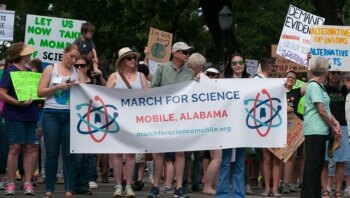 A Day for Science, sponsored by March for Science Mobile, is our second event hosted as an official satellite of the national March for Science organization. In 2018, we have the only satellite march registered in Alabama on April 14th, the date of the national event, and we are one of only a handful of Gulf coast satellites participating. We are fundraising $200 to help pay for the traffic safety officers we will need to hold our march in downtown Mobile. In 2017, many respondents to our post-event survey said that the march itself was one of their favorite parts of the event. That's why we wanted to retain that activity as part of our 2018 event. However, the traffic safety officers we need to block the streets so the march can take place cost $360, and we still need to raise $200 to cover that cost. Our payment will be due after the event is held. Help show the world that Alabama and the Gulf coast are strong advocates of science! Your donation of any amount by April 14th is appreciated and will demonstrate that science is important to our state and the region.